Things many fishermen take for granted – something as simple as getting into a boat – are a bit complicated for Terry Saldeen. Saldeen, a partial quadriplegic, spends his life in a motorized wheelchair. But that doesn’t stop him from going crappie fishing on Truman Lake in west-central Missouri. It’s just … well, complicated. While able-bodied fishermen just hop into a boat, Saldeen relies on a high-tech lift to remove his heavy wheelchair from the back of his truck. Then after his wife or another able-bodied helper backs his pontoon boat into the water, he uses a ramp he designed to get on board. Today, he follows the same mantra. 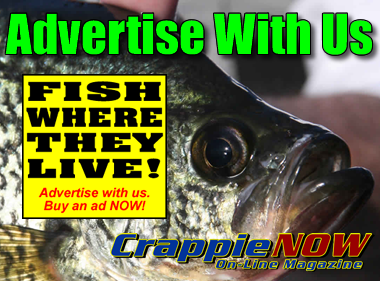 He is an avid crappie fisherman and even runs the Fat Slabs Guide Service. He caters to other disabled fishermen, striving to show them that they can do many things they never envisioned. Like reeling in a slab crappie. “I took a woman who was a full quad out fishing,” Saldeen recalled. “I had her use an electric reel, and she just had a great time. She had a smile that was ear to ear. Saldeen has shown many disabled people that they indeed can accomplish big things in a fishing boat. “I try to instill in people that if you want something bad enough, you can do it,” he said. “You can’t wallow around in self-pity. But Saldeen’s clientele is made up of more than just the disabled. He also guides able-bodied fishermen, many of whom stay at the Reel and Trigger Resort that Saldeen’s wife manages. “Some of them are a little skeptical at first,” he said with a laugh. “They think that just because I’m in a chair, I can’t get around. Saldeen requires the assistance of an able-bodied person, usually his wife, Lisa. While she is recovering from rotator cuff surgery, his friend, Mike Piers, has been assisting. Guess what Terry Saldeen’s favorite color of tube jig is when he fishes murky Truman Lake? Yes, it’s chartreuse. But make no mistake, Saldeen does the guiding. 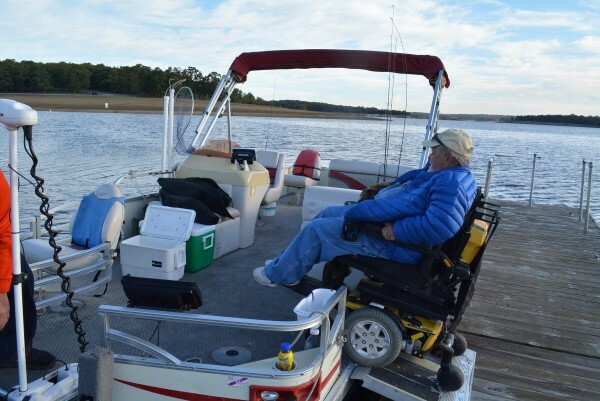 He sits in his wheelchair at the bow of his pontoon boat, with his fish locator and trolling motor in front of him. He uses a remote control to run the motor and get customers over brush where he is marking fish. Even in a wheelchair, he is remarkably mobile in the boat. “This wheelchair will spin on a dime,” he said. 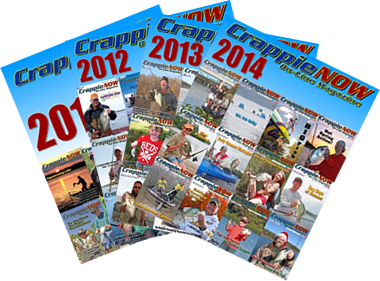 Saldeen has caught a lot of big crappies out of that chair. Consider a trip in mid-October. He made a short cast with a bright-colored tube jig and let it sink to the level where he had marked fish and was greeted with a sharp tap. He set the hook and pulled a 10-inch crappie to the surface. That was the first of many he and Piers caught before the wind became too strong and they had to change locations. “I fish year-round here on Truman,” Saldeen said. “We’ll be out here in January, when it’s freezing cold, but we’ll catch fish. 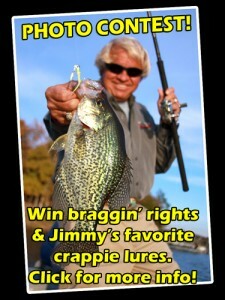 Swinging a crappie into the boat is part of the fun of any crappie trip. Here, Saldeen gets in on the fun. 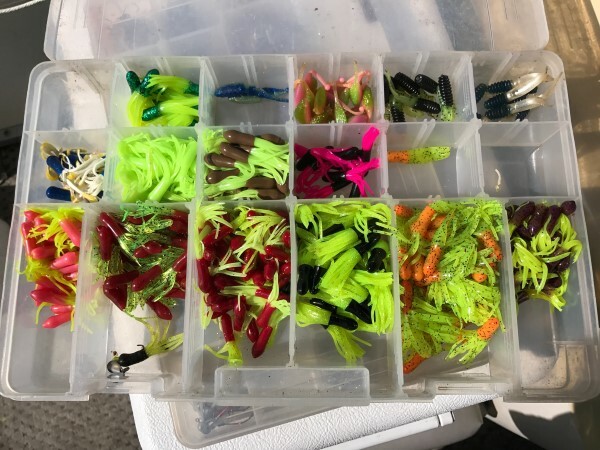 Saldeen has several tackle boxes full of bright-colored tube jigs he drops into the brush and flooded timber on Truman. But there always are two constants: one of the hues in the multi-colored tubes has to be chartreuse (black and chartreuse and red and chartreuse are his favorites). And he has to attach a Crappie Nibble to the hook. 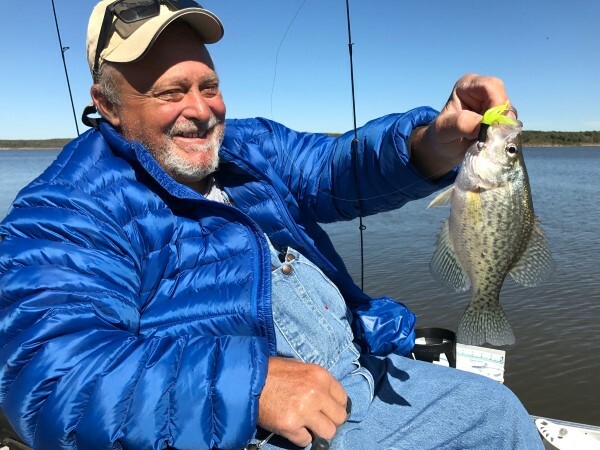 Barry Chadd of St. Joseph, Mo., is one of Saldeen’s many customers who are sold on his ability to guide fishermen to big crappies. 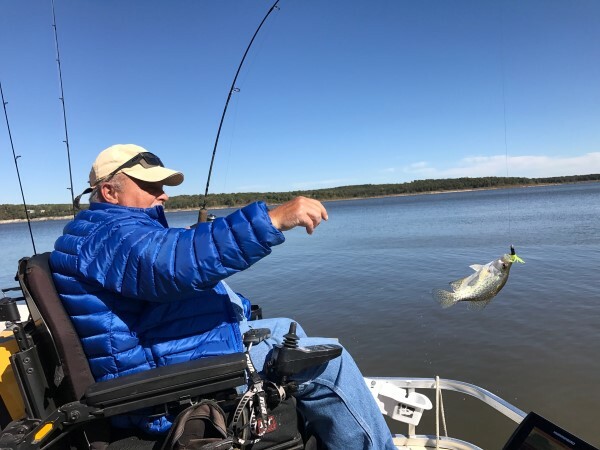 Chadd, an incomplete quadriplegic himself, called the Reel and Trigger Resort several years ago to find a guide for him and his able-bodied granddaughter. He immediately knew that Saldeen was a perfect fit. “We had two things in common: We were both disabled and we both loved to catch crappies,” said Chadd, 57, of St. Joseph, Mo. The group went out at night and fished under floating lights that Saldeen put out. And they caught a limit of crappies, some of them the slabs that inspired the name of Saldeen’s guide service. Chadd has been coming back ever since. Saldeen grew up fishing for crappies in Iowa. He lived only a mile and a half from the Mississippi River and he was constantly traveling there to fish, even after his accident. Terry Saldeen uses a ramp to get aboard his pontoon boat before embarking on another guide trip. 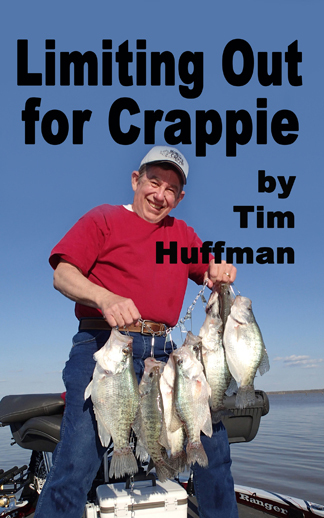 He doesn’t let his disability hold him back when he goes crappie fishing on Truman Lake. A partial quadriplegic, he is has spent the last seven years guiding customers to big fish out of his pontoon boat. He discovered Truman by accident when he was looking on the internet for places to fish. He and his wife traveled to Missouri and immediately fell in love with the timber-filled reservoir. He made a deal with the owners of the Reel and Trigger Resort to rent a cabin for several months while he fished there. That was 10 years ago, and he and his wife have never left. He opened his guide service in 2011 and he has a loyal following. These days, Saldeen guides three or four times a month and helps his wife Lisa run the resort. “If you’re a crappie fisherman, this is a great place to live,” he said. “It took me a while to learn how to fish here. In Iowa, we did a lot of casting. Here, you have to do a lot of pitching. Saldeen suffered a heart attack in 2017, and he was off the water while he recuperated. But by the fall, he was back fishing for crappies and enjoying life. “When my mom was dying, she told me “You’ve gone through a lot of tough times, but you never let it get you down,’ “ Saldeen said. “And that really touched me. “I try not to feel sorry for myself. I have a great wife who is the best caregiver you could ask for, we love to fish together and we manage a resort that we love. Contact Info: Fat Slabs Fishing Guide Service on Facebook or call 660-723-1469. Reel and Trigger Resort on Facebook or contact at 660-438-2580.